A stadium for beach volleyball usually consists of a center court, two grandstand facilities, one widthwise and one lengthwise, a VIP platform, and a food and beverage area outside the playing field. "But what if the playing field and the food and beverage areas were not separate from each other? What if the audience could move about freely, even during the matches, so that they could experience the entire event even more intensely?" These were the questions the organizers of the AVP Beach Volleyball Tour in the USA asked themselves. They commissioned NUSSLI with creating a concept for an innovative stadium which would cater to the needs and lifetstyle of an active beach volleyball audience. Aspects such as interaction, entertainment, lifestyle, and identity in the form of a distinctive look and feel to the AVP event led to an innovative stadium model which offered the audience even more experiences and provided sponsors with additional options. Lounges, party areas and hospitality zones merged seamlessly with each other; at any moment, the spectators could watch the game from the area that best appealed to them. 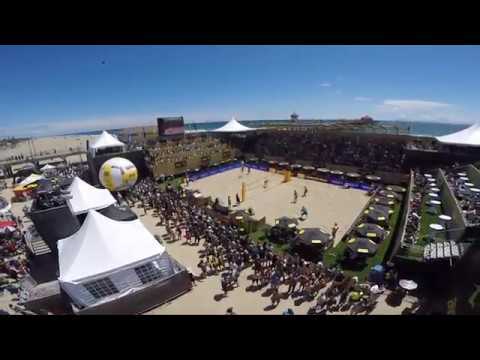 The AVP arena appeared at eight extraordinary locations in various American cities during the 2016 tour. However, NUSSLI's involvement was not limited to developing the stadium concept in cooperation with AVP and planning the event structures at seven of the eight event venues. The project team was also on the road during the entire tour to assemble the AVP arenas in Seattle, San Francisco, Huntington Beach, New York City, Cincinnati, Chicago and New Orleans, and dismantle them after the events. The team hired caterers, sound equipment and all other service providers for managing the event, planned the logistics, and much more. And it also made sure that, ultimately, nothing remained of any of the tour stations — except for memories of the unrivaled event.